Bridgeport, CT—The Housatonic Museum of Art (HMA) is pleased to announce the opening of two new installation pieces by New York artists Mary Giehl and Kim Waale. With both artists using maps to orient the viewers, the installations are intended to raise awareness about our relationship to the environment and, in the case of Giehl’s work, its/our ability to sustain life and to support the almost 1 billion people now facing issues of hunger, water shortages and habitat destruction. Both exhibits will be on view from February 12 through March 18, 2016. The HMA will host an opening reception for the artists on Thursday, February 11 from 6pm until 7:30 pm. with an informal gallery talk by the artists from 5:30 until 6:00 pm. This event is free and the public is cordially invited to attend. On March 18, the last day of the show, from Noon until 5:30pm the public is invited to bring a canned food item to be donated to the Bridgeport Rescue Mission and in return will receive one of the bowls from the Rice Is Life installation to keep. Maps tell stories. They speak of discovery and conquest, of inequality and exploitation, and of privilege and power. Maps not only provide a concrete shape of the world, but they also shape our ideas and knowledge about the world, informing our perceptions of others as well as our own identity. 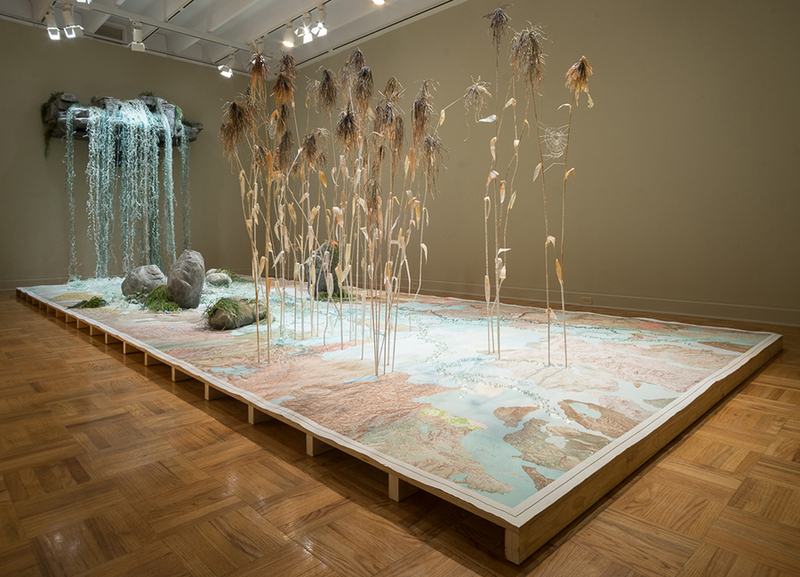 Although both artists use maps to situate us within their works, each artist leads us to a very different place: Mary Giehl’s Rice is Life navigates the geopolitics of food while Simulacrutopia (again,) constructed by Kim Waale, leads us on a melancholy journey to a “make-believe” environment that bears no relationship to the real one. Rice is Life, is the visual manifestation of world hunger. In the first decade of the 21st century, according to foreign policy writer Lester R. Brown, access to grains has emerged as the dominant issue while the world transitions from “an era of food surpluses to a new politics of food scarcity.” Giehluses rice, the main food staple for people around the globe, as a sculptural medium, to fashion bowls comprised of white, red and black rice. Red threads shoot through each vessel and serve as a metaphor for our interconnectivity and interdependence as global citizens. Giehl’s work beautifully documents the largest populations within developing nations such as Sub-Saharan Africa, Asia, South America and the Caribbean that depend on rice as the mainstay of their diet. The bowls are suspended from the gallery ceiling, like looming clouds of uncertainty, that warn of rising temperatures, water shortages and population growth that threaten the world’s food security. Simulacrutopia (again), on the other hand, underscores the prophetic vision of the French philosopher Jean Baudrillard who observed that our postmodern society no longer makes a distinction between the real and artifice, stating that there is only the simulacrum. ”On Exactitude of Science,” a story by poet and writer Jorge Luis Borges, describes the replacement of the real with artifice. In the fable, a Cartographer’s Guild is charged with the making of a map designed to record (and replace) the Empire perfectly, so that the image of place is paramount to the place itself. Borges’ story aptly illustrates Baudrillard’s assertion that post-modern society has no relationship to the real, a world where style now trumps substance. Simulacra replaced the real, leaving us “outside” nature, essentially at a remove from the natural world. But Borges’ tale is also a metaphor for post-colonialism as well as postmodernism, the map merely a tattered remnant of cultures, fragments of meaning, and difference. And while we inhabit a world of illusion, of spectacle, a virtual reality as it were, very real events threaten our existence. 46.5 million Americans face crises every day, choosing between nutrition, housing and healthcare, while 795 million people world-wide are struggling with malnutrition and hunger according to 2015 estimates provided by the United Nations Food and Agriculture Organization. Right here in Connecticut 11.9% of residents is food insecure. Although current food production could feed every person on the planet, poverty prevents the purchase of and access to food. In addition, global warming has resulted in extremes in weather conditions such as floods, droughts and disruption of the growing seasons---all affecting the food security of people around the world. Rice is Life and Simulacratopia (again) strikingly maps out the magnitude of the issues that we, as a global society, must address.